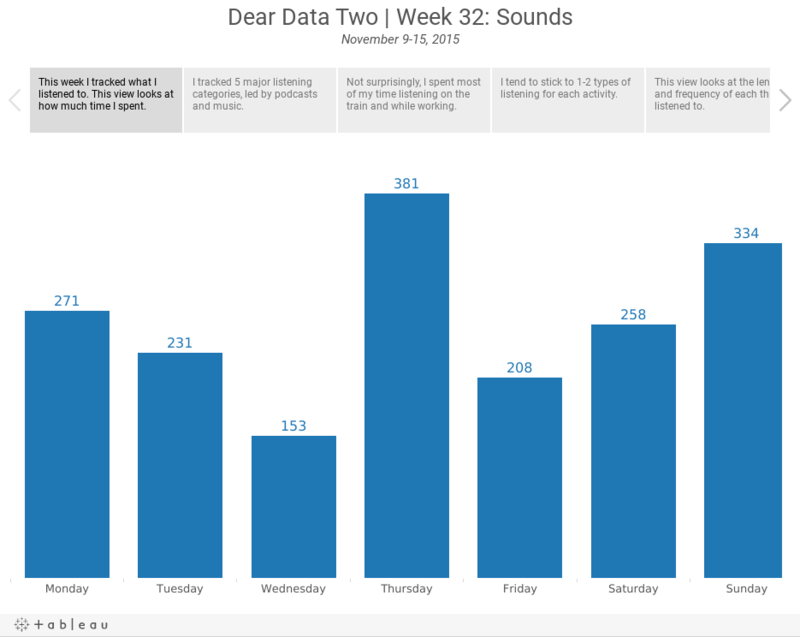 This week I wanted to keep data collection simple, as I had to travel to Northampton to run a 2-day Tableau training class. I tracked everything I listened to, where I was, what I was doing at the time and how long I listened. I tend to have a fairly set routine, so I didn't learn much about myself this week. Overall, I listen to podcasts on the train and when running and I listen to music at work and when running. I was hoping that adding the length of time listened would provide some insight, but it really didn't. The longest things I listened to were sporting events and movies, duh, of course! Anyway, here's my Tableau story that walks you through how I looked at the data. For the postcard, I drew inspiration from Giorgia's postcard, which looks like a sheet of music. I have my lines going down as well, but my didn't turn out quite as nice. It looks like I'm hanging myself when running.